There was nothing really beautiful about this big wooden barge. She was built at Bay City Michigan in 1881 to be exactly what she was . 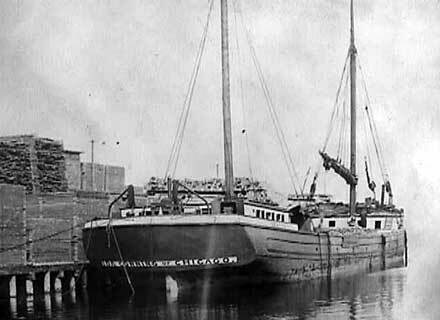 . . a "schooner-barge" that would spend its life on the Great Lakes in a line of barges under tow behind a steamship. The concept of tow-barges as an efficient and inexpensive way to carry large amounts of freight on the lakes may have been born during the Civil War when the nation's demand for ships to participate in the war effort created a shortage of freight carriers. To compensate, a fleet of tired and worn-out wooden schooners and other wind-powered vessels were patched and converted for use as barges. The idea proved to be so effective it was still being used when the Ida Corning came down the ways long after the war was over. 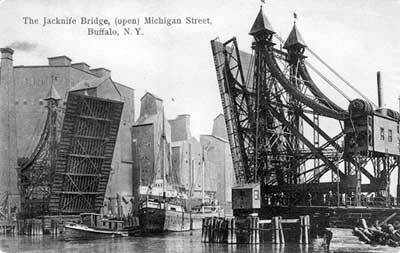 Built of sturdy Michigan Oak, the 168-foot-long Corning was especially designed to be the workhorse she was. She carried an after cabin on the main deck and a small forecastle deck forward, which also housed the winch and possibly a steam-powered donkey engine. The small cabin space offered little room for members of the crew or machinery. The vessel was carefully designed to utilize as much space as possible within its cavernous hull for cargo. While it was never intended that the Ida Corning would operate under sail, she was equipped with two masts and schooner rigging. This was like an emergency operating system in the event of trouble. Many a crew of such schooner barges were forced to raise sail after towing lines snapped in severe weather. The Corning enjoyed a remarkably long career of about 50 years on the lakes. She carried lumber during the last days of the Michigan lumber industry following the great forest fires of 1871 and 1881. By 1908 she was sold to the Sturgeon Bay Stone Company and went to work as a stone barge. A well-built ship and good seamanship are probably to be credited for the years of service that passed nearly accident-free. We say nearly, because the Ida Corning was run aground at least once. This happened in November, 1908, was the Corning was under tow behind the tug Duncan City in dense fog and struck a shoal at the Clay Banks along the Southwest Michigan shoreline of Lake Michigan. While being pulled off the shoal the Corning struck a rock and damaged its shoe and rudder, which required costly repair. The Great Depression dealt a death knell to old vessels like the Ida Corning. She was one of several ships left abandoned at the Sturgeon Bay Stone Company's Bullhead Point wharf after the 1929 crash. The Corning, Oak Leaf and Empire State were all burned to the waterline in 1931 to prevent possible lawsuits after the old ships became known as popular haunts for youth and sport fishermen.